This is customized to your site and your data! Scroll down for a more complete description. Sold out? Not ready to buy? Want it each quarter? Click here to get on the wait list to be notified the next time this product becomes available! This is a customized keyword plan that includes the exact words you should use for a landing page as well as the long-tail keywords for 12 blog posts that will help you build that landing page. Take a walk through your webmaster tools and you can very easily get overwhelmed. Which keyword plan will have the most impact? What keywords should I work on right now to make an immediate difference? Give us access to read & analyze your Webmaster Tools and we will give you the exact plan that you need to rank well for words that Google already sees you as an authority for! This will help you increase your page-views and sessions. It will help you increase your search engine authority and clicks. Note: this is a more advanced product. You must have at least 3 months of data within your webmaster tools console. Upon purchase, you will receive a note from us that walks you through adding either Kelli or Crystal as a read & analyze user to your WMT account. After analyzing your WMT, we will determine which keyword topic you should be focusing in on over the next 12 weeks and will give you the exact plan you need to follow to make things happen for you. This is by far the best SEO help I have found online. I cannot thank you enough for this amazing resource! I have been stumbling along in the dark for so long with my SEO and to have a 12-week step by step blog creation specific to my niche plan is a game changer for me. And now my SEO is getting better, and my Google pageviews are growing! Thank you Kelli and Crystal! Having Kelli and Crystal create a keyword plan was more helpful than I could have imagined. It was cool to see what they picked up in terms of keywords that Google Webmaster Tools was already sending traffic for. Their very detailed instructions mean that I can easily work from the plan and also create my own content plans for other keywords. This keyword plan helped tie everything I learned about SEO and landing pages together. I’m no longer spinning my wheels and can now use their keyword plan as an example of how to grow my pageviews. It is SO worth the money! Thank you Kelly and Crystal for this amazing help! Having a 12 week plan for improving my SEO and a writing plan is so helpful. I have dabbled in SEO but not until now, do I feel that I am really making progress and doing something that Google loves as shown by my page views going up – and I have just started with you! Thanks again for the wonderful advice and plan! I had considered purchasing the 12-week SEO Keyword Plan for several months before I finally made the leap. Once I did, I found myself wishing I hadn’t waited so long! I was so impressed by the plan that Kelli & Crystal came up with for me that now I want more keyword plans! The plan is exactly what my audience wants and they presented it with details as to what to write first, how to set up my landing page, and even the term to use to tag my photos. Blogging can take so much time. It’s wonderful to have a trusted source to turn to when you get stuck or need a bit of help. Kelli and Crystal create a keyword plan was one of the best things I’ve purchased to help me with SEO. They found keywords in my Google Webmaster Tools that I had never even noticed before. Not only did I get a great content plan, I got to understand the process more too! I already own all of Kelli and Crystal’s courses, but I’m so thankful that I bought a 12-week keyword plan. Kelli and Crystal helped me get clarity on my blog’s overall focus, in addition to my blog posts. I’ve been writing a “lifestyle” blog for almost four years (and often feeling like my blog was a “hot mess hodgepodge”), but they helped me sift through my Google Search Console. They found keywords that would help me create posts to promote my next product (which I’m creating out of one of the posts from my keyword plan) and round out my content. Bonus points: two of my last posts are already in my top ten posts for the month. This was my first keyword plan, but I can’t wait to get another! This was such a great investment for my own sanity because it gave me focus and because it gave my readers content that they actually want to read. I LOVED this keyword plan! One of the posts they recommended has been in the top three consistently and is currently sitting at number one! It’s a high traffic keyword but it never would have crossed my mind to write the post before they suggested it. I love that this was specifically done for my site and as soon as I finish writing the posts on my list for this time, I’ll be getting on the list for another keyword plan. It’s worth every penny! Even though I sometimes had dozens of ideas for posts I struggled with finding topics that would advance my site and get more pageviews. Having this product really helped me see where I should be focusing my time to get the best results. Helping me work smarter! It’s a great product if you’re like me or even better if you’re struggling to generate new ideas for posts. I never really understood much of anything when it came to having a keyword plan. I knew I needed a plan but I had no idea how to come up with it myself. 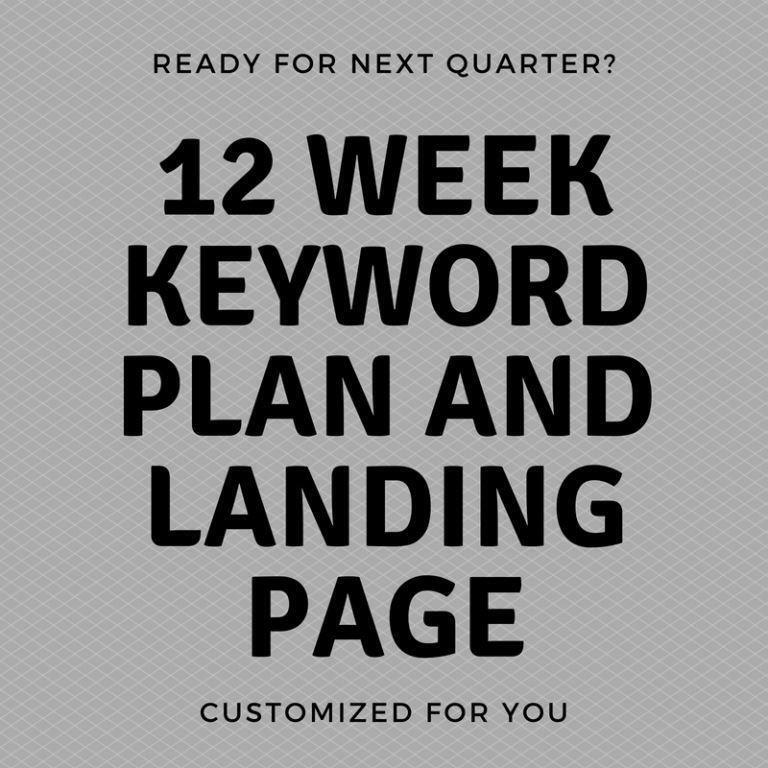 When I realized I could purchase a detailed 12-week keyword plan from Learn to Blog Hangouts, I jumped at the chance to have someone do this for me. I love that Kelli and Crystal didn’t just tell me why I needed a plan. They actually gave me a step-by-step process of what to do and I’m currently working on that plan now. In the past, I’ve taken so many courses on how to improve my SEO. I finally found someone that knows their stuff and more importantly, they don’t just tell me what I need to do. They show me how to do it. This was the best money I’ve spent. It is such a huge weight off my shoulders to have this done by Kelli and Crystal. I trust their knowledge about keywords and SEO and the plan they created for me was amazing. Once I’m done working my through it, I will totally purchase another one! Thank you Crystal & Kelli for the amazing keyword plan! I’m so happy I decided to purchase this! It has helped me to serve content that completely serves my audience well–I know this because each keyword/keyword phrase I’ve written about from the plan you put together for me has gained amazing organic traffic/reach! Thank you for helping me help my audience! When the keyword plans came out the first time (or at least the first time that I saw them offered) I hopped on the opportunity because I was so excited to see what keywords they thought I needed to focus on so I wouldn’t waste time on the wrong keywords. I’m so glad that I purchased it and to say that I’m addicted to their keyword plans now, is an understatement. I want a new one every time they’re available! It’s so refreshing to have another set of eyes on what I should be focusing on when it comes to tackling keywords! Thank you!